The weather is cooling, the days are getting shorter and the last of the leaves are falling off the trees in your yard. If you live in one of the snowy states, you may love autumn, but fear the fact that the next season to come along is winter. This may be especially true if you have an unwanted car sitting in your driveway. Plus, it’s almost the end of the year and you don’t want to miss out on your end-of-the-year tax deduction! Here are 10 compelling reasons to donate that unwanted car before the snow comes. You might want to give us a call to donate your car today, and we’ll be ready for you if you do! For more information on donating your car, check out our 2013 Donate Car To Charity Guide. Clearing your driveway takes up enough time. Why try to work around a car that you don’t even want anymore? When you donate your car, you can get the whole driveway done without having to work around the vehicle. Plus, the driveway will look nice and be a lot safer to walk on. Driving a car that’s sitting outside in the elements means scraping off windows that are covered with snow and ice. Whether you are selling your unwanted car or taking it for a spin, you’ll have to scrape those windows down over and over again while it’s sitting outside. Plus, getting into a freezing car that has been sitting outside for months is a nightmare – especially if it’s so cold that it won’t start. When you donate your car, we’ll pick it up or tow it, so you won’t have to do any scraping or sitting in the cold driver’s seat! There is nothing worse than having your Thanksgiving or other holiday guests park on the street when it’s snowy and icy, so you’d ideally like to have enough space in your driveway for them to park their cars. If you donate your unwanted car before the holidays, you’ll open up an extra space in the driveway for your loved ones! Plus, you won’t have to risk anyone getting towed if they park on the street and stay over a little too late. Time flies when you’re having fun with family! There’s nothing like being curled up on the coach, holding a mug of hot chocolate, lighting a roaring fire in the fireplace and staring out on your beautiful snow-covered yard. Then you look over and see your unwanted car sitting in the driveway, with snow piled high on top of it. What a way to destroy a beautiful sight! Since you’ll have extra space in the driveway and extra cash at tax time, it’s a perfect opportunity to purchase a new car that is more reliable for winter driving. Not that you’ll want your new car sitting outside in the driveway, but there will be extra room in the driveway if someone’s car gets moved out of the garage. 7. That Extra Space In The Driveway Can Be Put To Better Use: Snow Angels And Snow Men! If you choose to keep that spot in the driveway vacant, it gives the kids extra space to make snow angels or build snow men. Kids love playing in as much snow as possible, so they’ll love that you moved that unwanted car out of their way. When you get rid of that unwanted car and can finally stop paying insurance on it, you’ll provide yourself with some extra cash every month that can be used to purchase extra holiday gifts for your family and friends. Maybe you’ll even choose to treat yourself to a fun day on the slopes or a relaxing day at the spa. You parted with that unwanted car of yours for a great cause, so you deserve it! 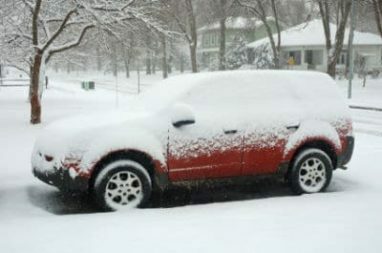 By the time you actually need to get that unwanted car out of the driveway, it may be completely snowed in. Donate it before that happens! There’s nothing like having to get your car shoveled out from being snowed in, so save that for emergencies – not just to get your unwanted car out of the driveway. One huge reason to donate your car to Wheels For Wishes benefiting Make-A-Wish before the snow comes is that you will help your local Make-A-Wish chapter grant the wish of a child with a critical illness. You could give a child an opportunity to spend the day with Santa during his trip to the mall, or indulge in an exciting shopping spree at Toys “R” Us. Whatever a child decides, it will be because of your generous decision to donate your unwanted car.